What's Next: US-China Escalation: President Trump is considering an executive order to block China's Huawei and ZTE from selling smartphones in the United States, two sources familiar with the White House's thinking tell me, confirming a WSJ report. The threat comes as US and Chinese officials meet in Beijing for highly anticipated trade talks. How to Read It: The campaign against China's biggest telecom companies appears to be intended to create a climate of uncertainty in both countries. Threats against Huawei and ZTE bolster the perception that the White House is acting tough on China while making it harder for AT&T, Verizon and others to do business with those companies. The Big Picture: The pressure on Chinese tech and telecom, including tariffs targeting China's ambitions in robotics, electric cars and computing, will not slow the country's rise as a technological super power, analysts tell my colleague Sherisse Pham. Bonus: Xiaomi, one of the world's biggest smartphone makers, has filed for an IPO in Hong Kong. It is looking to raise at least $10 billion. Good morning from New Orleans, where we've been enjoying jazz, Sazeracs and soft-shell crab amandine. 11:40 a.m. CT: I'll talk to Wyclef Jean, Major Lazer's Christopher Leacock and Combs Enterprises' Dia Simms about music and technology. 2:35 p.m. CT: I'll talk to Kleiner Perkins' Eric Feng, Khosla's Benjamin Ling and Harvard Business' Julia Austin about startup investing. Tesla stock opened 8% lower today after a bizarre earnings call in which Elon Musk called one Wall Street analyst's question "boring." • Musk to an analyst who asked about capital expenditures: "Excuse me. Next. Boring, bonehead questions are not cool. Next?" • Musk to the next analyst, who asked about Model 3 reservations: "These questions are so dry. They're killing me." • Musk on journalists who questioned the safety of autonomous vehicles: "It's really incredibly irresponsible ... because people might actually turn it off, and then die." What Tesla reported: A $700 million cash burn in the last quarter. Why that's OK: Investors expected Tesla to burn money on Model 3 production, and the company finally met its target of producing 2,000 or more cars for three consecutive weeks. But Wall Street analysts are not happy: "Elon, you've got to grow up," Kelly Blue Book's Rebecca Lindland said on CNBC. "You've got to stop looking at shiny objects and you've got to get on track." The Big Picture: DealBook's Andrew Ross Sorkin asks: "If Tesla asks Wall Street for money again, what will the answer be?" Lyft CEO John Zimmer tells me he still believes that by 2025 it will not make economic sense for Americans in major urban areas to own cars. The gist of what Zimmer is saying is right, even if the timeline may be overly ambitious: Cars are an economic burden and innovations in autonomous transportation should, at some future date, rule out the need for humans to drive themselves around a city. • Zimmer on Lyft vs. Uber: "We believe we're about 35% market share in the United States. That's up from about probably 12% a couple years ago. ... We're growing significantly faster than Uber." • The Information's Amir Efrati says Lyft had a chance to catch up with Uber last year, but moved too slowly "in developing features for riders and making decisions about new markets." • The Lyft Long Game: Continue to improve the product while differentiating from Uber by telegraphing a values-based business model. • The Uber Long Game: Improve the company's reputation before taking it public by highlighting attempts to diversity the workforce. • James Bailey, a Professor of Leadership Development at George Washington's School of Business, tells me Uber's job "is easier than it looks. ... From rock-bottom, there's no place to go but up. ... Uber's got every asset but reputation in place. Any turn in the right direction will be heralded as heroic leadership." • Sen. Blumenthal sent a letter to the Uber CEO asking him to "immediately stop using forced arbitration agreements against victims of sexual harassment or assault." • "The move comes in response to an exclusive CNN investigation ... that found at least 103 Uber drivers in the United States who have been accused of sexually assaulting or abusing their passengers in the past four years." • The CNN investigation also found that 18 Lyft drivers had been accused of sexual assault over the same four-year period. • "This is an issue that is a problem for society ... One incident is too many in society and one incident is too many on our platform." • "We were the first to put criminal background checks in place for the industry; [we have] driving record checks that were more strict than what taxis and limos had done previously; and a million-dollar insurance liability policy." • "But we should all be doing more, and when there are opportunities to do more we should continue to do that." Amazon and the Seattle City Council are locked in a bitter dispute over a new tax measure that could have radical implications for Amazon's business and Seattle's economy. It is a crossroads moment for both the city and its largest employer. • "The Seattle City Council wants to impose a 'head tax' on businesses to fund programs to address homelessness and affordable housing. Companies would pay ... roughly $540 a year for every full-time employee." • "Amazon is ... in the bull's eye of the proposed tax: With more than 45,000 employees, Amazon could pay more than $20 million a year." • In response, Amazon says it "is temporarily halting construction of a new 17-floor tower ... and may sublease its space in a major downtown development. The two projects [were] expected to create 7,000 Amazon jobs plus more in construction and other industries." What's Next: The City Council plans to vote on the tax proposal on May 14. Seattle Mayor Jenny Durkan says she is "concerned about the impact [Amazon's] decision will have on a large range of jobs" and will work with both sides to find common ground. • The third biggest market cap company in the world can go almost anywhere it wants. It is currently considering 20 finalists for its second headquarters and this week announced staff expansions in both Boston and Vancouver. • The fight is leaving Amazon open to criticism that it doesn't really care about the communities it lives in. At Vox, Matt Yglesias says "cities hoping to win Amazon's HQ2 should watch what they wish for." Amazon also paid zero federal income tax in 2017. The Big Picture: Tech companies have stretched the cost of living in Seattle, San Francisco and L.A's west side to a breaking point. Figuring out how to balance the benefits of big tech with the needs of ordinary citizens is one of the major challenges for civic and business leaders throughout the region. Amazon has launched Wag, its own brand of dog food and other pet products, per Bloomberg's Spencer Soper. The Big Picture: "US pet owners will spend $72.1 billion on animals, care and supplies this year, with about $30 billion on pet food, according to the American Pet Products Association." • "The company announced Wednesday that it has topped 20 million US subscribers and is adding a slate of new shows and features — including an option to download episodes and watch them offline." • "Hulu's numbers still lag far behind Netflix, which has about 55 million US subscribers. Unlike Hulu, Netflix also has worldwide reach, with about 125 million total subscribers." The Big Picture: Hulu is an also-ran in the streaming wars. But it is also a joint-venture for Hollywood's biggest players -- including Disney, Comcast, Fox and Time Warner -- which means that it is likely to endure and eventually be bought outright by one of the above. Bonus, via Disis: "Hulu also announced a deal with the animation studio DreamWorks for exclusive streaming rights to upcoming theatrical releases. The studio ... will also make original Hulu shows for children and families." • From the announcement: "The goal of these events will be to ignite meaningful debates and conversations .... for the global marketing and advertising communities when integrating new technologies such as AI, Big Data, and blockchain." Who's in: Founding members include executives from The LEGO Group, Warner Bros. Entertainment, Sony Music Entertainment, Havas Media, Hearst Digital Media and a slew of advertising agencies. 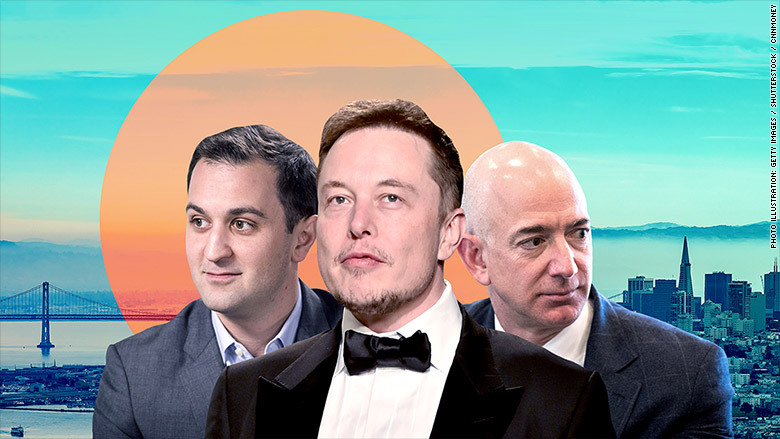 The Big Picture: In an over-crowded field of tech and media summits, conferences and festivals, this one appears to offer something new. What Next: Fortune's The Broadsheet, Kristen Bellstrom's daily newsletter about women in power.